The elementary moment in reconstruction after a large scale disaster is the re-housing of populations that have lost their homes and possessions. And despite the historical and social specificity of the built form of the house, it is dramatically under-theorized in a post-disaster context. Through its material, built form and through its visual representations, the reconstructed house is a site where and through which global categories and frameworks are constructed and reproduced. This paper looks at how it is both defined by and contributes to the (re)production of the space of the international and in particular, to an international ‘humanitarian imaginary’. In their work on the nation, Jones and Fowler look at the importance of local spaces in the reproduction of the nation. They argue that this (re)production is done in several ways including that ‘localised places’ are used as “‘metonyms’ of the nation” and come to represent, “in a generic and abstract sense” “national messages, symbols, and ideologies.” (2007: 336) Citing Jackson and Penrose (1994) they “stress the potential for localized places to be key sites for generating ideas and sentiments that can ultimately reproduce the nation.” (p. 336). If we take these arguments to the level of the supra or international, we begin to see the potential of place in the (re)production of international scale and in specific aspects of the ‘international’ as a collective concept. An important narrative in stories about international, or cosmopolitan identity is that of international humanitarian assistance: the imperative, or expectation that those actors capable of assistance those in need should do so. Drawing on Charles Taylor’s concept of a ‘social imaginary’ and Craig Calhoun’s subsequent elaboration of the ‘social imaginary of emergencies’ the idea of an international ‘humanitarian imaginary’ is embodied, in part, in the built form of the reconstructed house. The first part of this paper, provides a brief genealogy of housing in the context of reconstruction, and begins to unpack some of the cultural and historical assumptions associated with this practice. It problematizes the predominance of the single family dwelling as the dominant building typology through an examination of two case studies: Hurricane Katrina and the Katrina Cottage; and the houses built in and around Banda Aceh, after the 2004 South East Asian Tsunami. Through recourse to contemporary architectural theory, I suggest that while the built form, the materiality of the house, is indeed a vital aspect of reconstruction, it may not be for the reasons that are immediately apparent, but rather for what it represents to the various actors involved in its reconstruction and use. As such, the act of rebuilding a home becomes not only an act of place making – but also an act of place taking and giving, and is inseparable from the interactions and contestations that this involves. After a large scale natural disaster, there is an inordinate focus on the reconstruction of single family dwellings, or ‘houses’. In the context of a large scale reconstruction, the success or failure of the reconstruction effort is popularly judged according to the number, speed, and arguably, quality of houses built. Media accounts of the reconstruction of the Indonesian autonomous province of Aceh, one of the hardest hit areas after the 2004 South East Asia Tsunami, focused almost exclusively on progress in housing construction. Progress reports and representations of the Tsunami response by the large international aid agencies such as Oxfam, and Care, give prominent focus to the built form of the house – both visually and in their choice of monitoring indicators. But is this focus on externally provided houses – particularly when separated from discussion of location, infrastructure, water & sanitation, livelihoods, and subsequent use – the best way to approach reconstruction? The right to housing is enshrined in a variety of international documents. According to Cornelis and Vitale (2005), “The strongest reference to housing rights in the international legal context is the right to adequate housing as enshrined in Article 25 of the Universal Declaration of Human Rights and article II (I) of the International Covenant on Economic, Social, and Cultural Rights (ICESCR).” In their 2002 publication, UN-HABITAT and the Office of the United Nations High Commissioner for Human Rights (OHCHR) assert the legal importance of ‘adequate housing’. Since the adoption of the Universal Declaration of Human Rights in 1948, the right to adequate housing has been reaffirmed and explicitly recognized in a wide range of international instruments as a component of the right to an adequate standard of living, and joined the body of universally accepted and applicable international human rights law. The most commonly observed approach to the reconstruction of permanent houses is a small, single story, house with 2 or three rooms: most often one living/bedroom, a kitchen and/or an adjacent living area/bedroom. They are constructed from a small range of materials – usually cinder block, brick or concrete. In Aceh, the same design proposals were seen over and over despite consultations with the target communities and a lack of initial guidelines from the government. (Fig. 1 & 2)) The designs were remarkably similar – at least in external appearance – to approaches seen in other post-crisis settings including those as geographically diverse as Kosovo, and Rwanda. Part of the focus on housing can be accounted for by the dynamics of the international institutions and organizations, whose objective is to provide assistance to countries to rebuild after large scale disasters. These include both large international and multilateral agencies such as the United Nations and the World Bank, as well as the international development arms of OECD governments and Non-Governmental Agencies. While the institutional arrangements and development literature, attempt to demarcate between those organizations whose objective is primarily humanitarian relief (UN Organization for the Coordination of Humanitarian Assistance; International Federation of the Red Cross) and those organizations who are tasked with assisting with long scale development (UN Development Programme, the UK’s Department for International Development), in reality, many humanitarian agencies continue working well into the reconstruction phase of post-disaster work. This is partly because the distinction between relief and reconstruction is itself an artificial one – with many ‘temporary’ solutions becoming permanent and many development interventions starting while a society is still operating in a relief framework. It is also partly due to the rhetoric of the international aid community itself, with many programmatic discussions in the 1990s and early 2000s advocating for the closing of the ‘relief to development’ gap. In the case of housing, the path dependence of the initial relief operations is particularly strong: many temporary or semi-permanent shelters becoming effectively permanent dwellings and the post-disaster displacements resulting in long term social restructurings. This blurring of the relief and development functions can be demonstrated by looking at the agencies that are involved in the housing sector – for example, in the case of Banda Aceh, two of the largest agencies involved in the building of permanent houses are the IFRC and Christian Relief Services (CRS). The mandate of both agencies is primarily relief, however after the Tsunami, various bottlenecks in the relief effort meant that even the provision of temporary shelter was massively delayed. With people still living in tents, 6 months after the Tsunami, it no longer made sense to provide temporary shelter or even transitional houses. Instead, both the IFRC and CRS undertook the construction of thousands of permanent housing units. The dominance of ‘relief actors’ in the provision of permanent housing after a disaster may partially account for the dominance of the single family detached housing model as the dominant approach to reconstructed housing. Within the context of humanitarian assistance, the dominant mode of shelter is that of the tent. While many architectural attempts have been made to provide alternative forms of emergency relief, the dominant typology of international assistance remains the tent. Even if established in a ‘row formation’ which allows for an adjustable length – this implies that the dominant unit of social organization is the nuclear family. If we translate the type and logic of the tent to a more permanent dwelling, the detached, single family dwelling becomes an obvious choice – so much so, as to be largely unproblematized, as a form, throughout the relief community. Both Fred Cuny (1983) and Randolph Kent (1987) trace the genealogy of natural disaster relief to the provision of relief from the damaged inflicted by conflict, beginning with Henri Dunant’s establishment of the ICRC in 1863 following the human suffering that he observed at the Battle of Solferino (1859). During and after WW1, the Red Cross movement “remained the single most important landmark in the evolution of humanitarian relief” however, Kent identifies the contributions of two other organisations as being particularly significant during this period. The Commission for Relief in Belgium and the American Relief Administration (in conjunction with the European Children’s Fund and the European Relief Council) provided basic assistance to war affected Europeans and with the end of WW2, the plight of millions of refugees gave rise to the creation of international response mechanisms through the newly created United Nations (Kent: 37). As emergency assistance moved from an ad hoc form of international activity to a more professionalized, structured activity the provision of emergency shelter grew in importance. Following both the first and second wars, the relief effort included the large scale reconstruction of houses to replace those that had been destroyed, and to provide new housing for displaced persons. And while high profile architectural contributions offered innovative design possibilities, in the main, most humanitarian NGOs relied on engineers to “design and oversee the construction of projects.” (Stohr: 40) Standards were developed for the design of temporary and transitional shelter, as well as accompanying components such as water and sanitation, layout of settlements, and guiding principles of interaction with the affected populations. However, until the mid 1980s, “the approaches and techniques used in relief operations” were still based on those that had been developed to assist European refugees and displaced persons after World War II. These included the establishment of large camps, located far away from the people’s original place of residence; the reliance on “temporary measure and goods supplied from outside the affected region” including food, blankets, tents, and clothing. Most importantly, “because the relief agencies operated in close cooperation with military occupation authorities, the approaches were often regimented and relied heavily on military-style planning and logistics for operation.” (Cuny: 18). In the late 1940s, the relief agencies operating in Europe began to expand their services into the trouble spots of the Third World: India, Palestine, and Korea required the agencies’ help in dealing with refugees. The agencies continued to use the techniques that they had used in Europe and adapt them to needs in the developing countries. The ‘WW2 paradigm’ continued to dominate until the 1980s, when various groups began to undertake significant and focused work to improve the international response to emergencies. These included the re-examining camp layouts: moving away from traditional military grid systems and towards more organic forms of social organization. Such proposals were in response to the recognition that temporary solutions often last years, if not decades and that relief should be designed in a way that enables long term, positive development. However, despite advances in camp design, and attempts to modify the design of transitional shelter, the single family dwelling or ‘hut’ typology (Hayden, 1984) remains the dominant form of reconstructed housing. The concept of ‘home’ has now been extensively discussed in various literatures. To be ‘homeless’ in Western society means that you are unable to be a functioning member of society. Without a fixed physical address – a home – it is almost impossible to hold down a job, to receive education or medical care. On a symbolic level, ‘home’ represents an emotional or spiritual grounding: a place where a person can feel comfortable, safe, and a part of their surroundings – be that a family, a community or a country. While no architect, or development planner would be so delusional, nor arrogant, as to claim that the reconstruction of a house is all that is required to re-establish a home, there is an assumption in the discourse of post-disaster reconstruction that while not sufficient, such an aspiration is both realistic and desirable. The conflation of ideas of shelter-housing-home can be seen in the slogans that are deployed by many of the organizations, for example: “Building Houses Rebuilding Communities” (UN-HABITAT, 2005); or “A Place to Stay, A Place to Live” (Oxfam Briefing Note, 2005). For many Europeans, and for many settlers in North America who came from Europe, the archetypal house is a hut with a peaked roof, a strong door, and small windows to resist snow, wind, and rain. The house may be constructed of wood, if it is near a forest; or stone, if it is near a quarry. One large hearth provides a warm, bright place, the center of nurturing activity. The archetype can be elaborated in its English, French, German, Scandinavian and American versions. As ham, domus, bauen, or log cabin, the image has been analyzed, romanticized, sanctified, psychoanalyzed, celebrated, and copied. Such domestic ministry also carries a strongly gendered association. Beecher goes on to say that “a woman, nurturing her spouse and children, could create a ‘model family commonwealth’ in her suburban home.” (Hayden, 1984: 23) The binary association of the female to the realm of interiority, the private and that of the male to the exterior, the public, has a long and well documented history. In the West, no other built form so clearly articulates the patriarchal structure of the nuclear family than the single family dwelling. “Post-war propaganda told women that their place was in the home, as nurturers; men were told that their place was in the public realm, as earners and decision makers. This ideal, gender-based division of labor [sic] described women’s and men’s economic, social, and political relationships to the private and public realms as distinctly different.” (Hayden, 1986: 42) The result was “a spatial prescription for married suburban bliss that emphasized gender as the most salient feature of every citizen’s experience and aspirations”; (Hayden, 1984: 42) a spatial prescription that, 60 years later, continues to dominate as the preferred mode of housing across the US and, as concurrently, as the preferred mode of re-housing after a large scale disaster. The ownership of a house remains the dominant life goals of the majority of Americans and Western Europeans. As a symbol, it represents achievement, stability and security. It is culturally preferable and seen as superior to other arrangements for living. It is also the primary locus of consumption. Under U.S. President Hoover, private, single family homes were established as a “national goal to promote long term economic growth and recovery from the depression.” (Hayden, 1986: 34) Not only did they provide a excellent potential for consumption with their endless possibilities of modern appliances, furniture and garden accoutrements, they also provided a locus upon which the capitalist worker, and his wife, could focus their energy, and see the material results of their labour. The connection between home ownership and national stability was clearly and overtly articulated in the policy of the time. Perhaps the strongest testament to the success of this rhetorical strategy is the complete absence, within American public discourse of alternative living arrangements, despite the inability or unwillingness of large portions of the American public to achieve the ‘dream’ of the house ownership. Such embedded assumptions are rarely foregrounded – and particularly not in the context of emergency reconstruction. These issues will be examined through two examples of reconstruction – first a case where a particular vision of society is communicated through the built form of the detached single family dwelling and second, a case where the generic form of the house is replicated as the dominant reconstructive form via the reconstructive process. The “KC 308” is 308 sq. ft. (420 sq ft., including porch) house composed of two main rooms arranged in a row: the living room (13’11” by 8’8”) and, behind it, across the rear of the house, the bedroom (7”0x13”3’). A small kitchen, lavatory and storage space occupy one side of the house and can be accessed off the living room. According to its website, it can be built with wood or steel framing and “are finished with fiber cement siding and a metal roof.” It is engineered to withstand hurricane force winds. Key principles of the design include that it is based on local vernacular, that it is easily and quickly erected (estimates of building time range between 7 days and 6 weeks), affordable, and can be easily modified. While certain elements such as the pre-fabrication, and purported ease of construction, make it potentially good choice for post-disaster housing – other purported benefits such as its affordability and adaptability are relative virtues – dependent upon other variables of the potential occupant such as secure land tenure and access to credit (costed at between USD 30 000 – 100 000 plus building costs, it is not cheap). An important part of the promotional material for the cottage is its growth potential. The initial cottage is considered to be a ‘Kernal House’ – which can either be expanded upon, through architectural additions, or converted into a garden shed, or guest cottage at the back of the lot once the real house is built. Images on the Lowes website include time lapse animation of the cottage being transformed from an isolated structure on the corner of an expansive, leafy, yard dominated by a new, expansive structure, many times larger than the original cottage. In the same way, the advice for “Using the Cottage: Building for the Future”, found on the CusatoCotages.com website, implies limitless room for expansion, in the new borderland of the post-disaster setting. What is omitted from these sketches, is one of the most pressing problems associated with reconstructive work – that of property rights and ownership. In many cases, those people who lost their homes cannot return easily to their original place: either it has been destroyed, or is being rezoned within the larger scheme of redevelopment. Significant work has been done to document the uneven swathe of damage caused by Katrina: those who lost the most were exactly those people who could least afford to do so. With persistent ambiguity over insurance claims, property rights and ownership, the dream of re-establishing oneself on a clean, lot remains exactly that. The images of the mansions on these web pages also raises obvious questions, such as where the income necessary for the reconstruction will come from if the residents have lost their jobs. And if the Cottage is truly meant to be temporary, why is a trailer not sufficient? Is it becomes what is being sold is less about the form of the cottage, and more about the possibility for a new life(style) that it represents. In order to demonstrate the historical linkages between Louisiana’s shotgun house and earlier, African architectural traditions, Vlach traces the genealogy of the house. In contemporary Louisiana, the shotgun house is most commonly associated with poor, black communities; its presence in visual representations of post-Katrina New Orleans, so ubiquitous as to be unremarkable. Vlach traces this history to the presence of free Haitian slaves in New Orleans, at the turn of the 19th century and their use of maison basse building techniques. 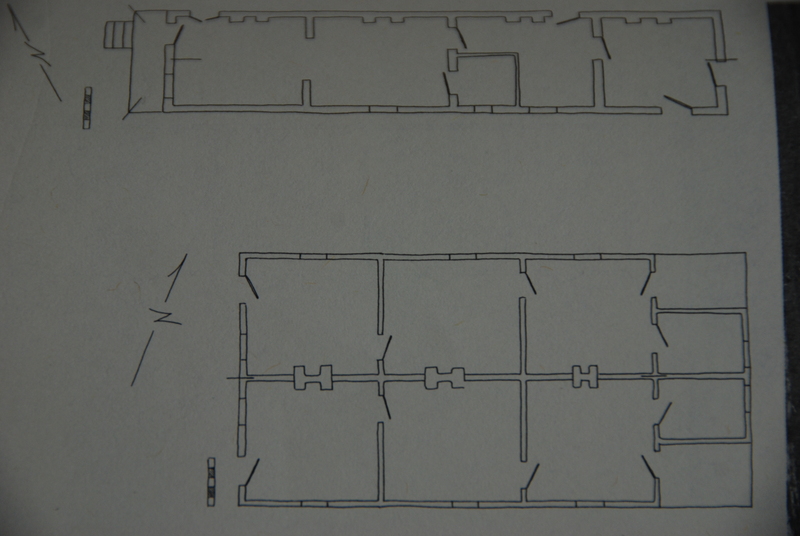 He shows the similarity between the floor plans of tradition Haitian homes (Fig 5) and the shotgun house of New Orleans (Fig 6). 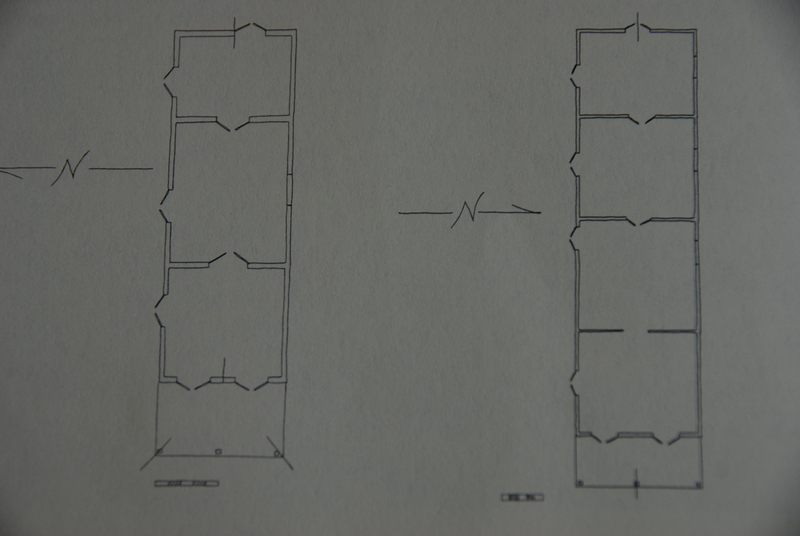 (Fig 5 & 6) plans in Upton & Vlach: 65 and 66). When we compare these plans to those of the Katrina Cottage, the are strikingly similar both in the layout, dimensions, and intended room use. (Fig. 5). The similarities in layout – rooms arranged in a row, with the entrance placed on the gable end, leading off a porch – is evident by looking at the respective plans. 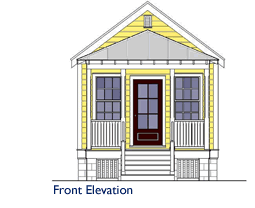 While the average dimensions of the initial Katrina Cottage (KC 308) had a shorter length than the examples of shotgun houses that Vlach found in Port-au-Prince or New Orleans, they are identical with regards to width. They are also similar with regard to intended room usage: multi purpose space at the front, sleeping quarters (reached through the multi-purpose space) at the back. The observed variations, or ‘sub-types’ are also similar between the shotgun house and the Katrina cottage with frontal ornamentation of (the appearance of) two doors (see KC 612) or the addition to the shogun house of extra rooms on the side (similar to KC 576). If we accept that the Katrina Cottage draws upon a shotgun legacy, Vlach’s observations have relevance in the post-hurricane landscape of the Gulf Coast. While the language and imagery used to market the cottage is one of Rockwellian Americana and a DIY attitude, the form and type of the cottage is one that draws upon the less publicized historical narrative of the US – that of slavery and its legacy of racial inequality. In the context of New Orleans, the spatial dimensions of this legacy were shown by the unequal impact that the hurricane had on its inhabitants with inner city, black populations being disproportionately affected both by the hurricane itself and by their lack of financial insurance against such an eventuality. It is ironic then, that the solutions offered not only draw upon a local, vernacular architectural form but that they subsume a subaltern architecture beneath a veneer of arch-typical middle class America. The irony runs deeper still. According to the New Urban Guild’s website, The Katrina Cottage has been designed using the concepts of ‘Living Traditions’ and ‘Most Loved Places’. According to the New Urban Guild website, ‘Most Loved Places’ are “the places in every region which have been valued the highest and loved the longest.” A living tradition is “something that resonates enough with the average citizen that they want to repeat it on their house, on their shop, or in their town. The implication of these concepts is that people will turn to, and value, classic architectural forms, such as the antebellum architecture of the Gulf Coast. The provision of an architectural form, which arguably embodies a legacy of subjugation, as the solution for the structurally disadvantaged groups hit by the hurricane, contains within it a double message. Superficially, the ornamentation and presentation of the cottage – the picket fences, the rocking chair, the flower bushes – offers the promise of a better life. The plans showing the growth potential emphasizing the need to work towards embedding the cottage within a larger landscape of success; of using the cottage as the stepping stone to a larger house, and a permanent, grounded, home. The promise of the ornament, is counterpoised to the threat of the form – the shotgun house – which evokes the memory of slavery, of structural poverty and entrenched discrimination. Suggesting that unless the necessary actions are made to improve the cottage, the fate of previous generations of shotgun owners is theirs to repeat. The building program is the implicit or explicit statement of spatial requirements to be fulfilled within the constraints of available sites, budgets, and technologies; it can be simple or detailed, but it will usually define the building type (such as detached one-family house, or thirty-unit apartment house) and the intended activities such as eating, sleeping, or parking the car. A program will also usually specify what kinds of spaces are to be provided for these activities, such as kitchen, dining room, bedroom, or garage; how large these spaces must be; and what sorts of daylight, mechanical systems, and other equipment are necessary. At the same time that the building program conveys the economic, social, and technical requirements for built space, the architectural style chosen for a building conveys the cultural requirements. The choice of style may be made by the client or by the designer; it can be as enduring as any religious dogma or as fleeting as high fashion. She goes on to say, “The one thing that architectural style cannot do is transform the building program. So if the basic social model of home is outdated, or the basic economic model of home is not appropriate, then architectural design cannot save the situation. Architects cannot make outmoded family etiquette modern; they cannot make false economic definitions of private and public work equitable. Because architectural style and building program represent form and content (or, if you will, cultural superstructure and material base), architectural styles and building programs often conflict in industrial societies. Within the context of reconstruction, the focus is generally on the built form of the house – with the larger building program receding into the background either as part of a larger reconstruction effort that downplays the importance of space (focusing instead on issues of economic regeneration, and livelihoods, abstracted from their material base) or due to the piecemeal nature of the reconstruction effort. By presenting the choice of a better life as one that lies with the individual – the structural aspects, and governmental failings are obscured. The focus on the built form of the house obscures the larger issues of why the disaster happens, which groups are disproportionately affected, and highlights instead micro-issues of ornament, façade, and layout. 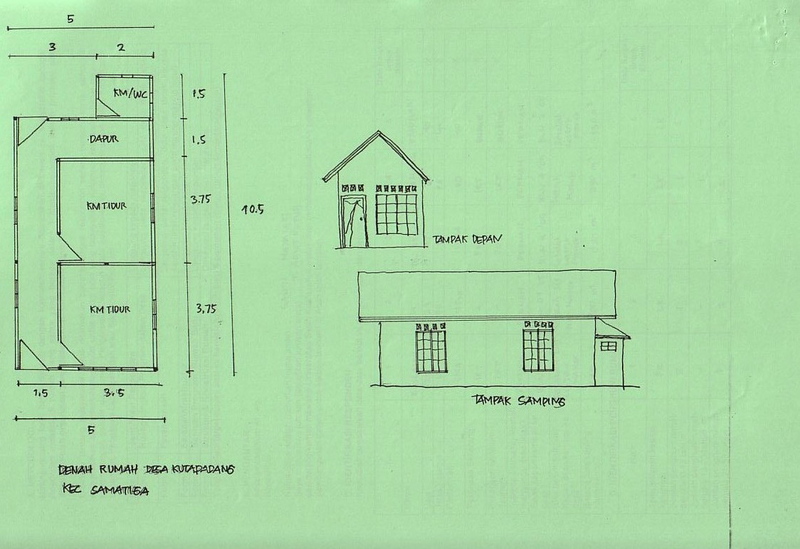 The packaging of the solution to the reconstruction effort in the form of a single family dwelling on private (seemingly limitless) property draws the attention away from larger context; one, where, a second Katrina is more likely than the eventual conversion of the Katrina cottage into a children’s play cottage in the corner of an expansive property. Just as the single family dwelling has come to represent, and even embody the value of the individual over the value of society, the Katrina cottage places the burden of reconstruction on the individual, as the form of the house implies a permanence that a wheeled trailer does not. [F]or the first time in history, a civilization has created a utopian ideal based on the house rather than the city or the nation. For hundreds of years, when individuals thought about putting an end to social problems, they designed model towns to express their desires, not model homes. 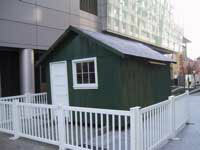 But isn’t the Katrina Cottage ‘better than nothing?’; better, as many of the disaster victims themselves have said, than the FEMA trailer? Perhaps. At the very least, Lowes franchising of the design demonstrates at least a temporary demand for the cottage although whether this demand is partly a result of the fascination with the Katrina disaster, or a love of the cottage itself, is unclear. There is even discussion of the adoption of the design by Habitat for Humanity, for use in its overseas housing projects. It is also remarkably similar to models made nearly a century earlier. 5,610 cottages were constructed to house over 16,000 San Franciscans in 11 refugee camps in locations including Dolores Park, Washington Square, Precita Park, Portsmouth Square, and today’s Park-Presidio Boulevard. Union carpenters built three main sizes of cottages between September 1906 and March 1907. Cottages had cedar-shingle roofs, fir floors and redwood walls. All were painted green to better blend into the parks and public squares in which they were erected. When the camps began closing in August 1907, refugees hauled cottages to private lots, and often cobbled together two or more to form larger residences. Of the 5,343 moved from the camps only a handful are certified to still be standing. Pictures of the preserved cottages (see Fig 8) show a remarkable resemblance to contemporary Katrina Cottages…perhaps reflecting a nostalgia for a time when disasters were manageable, and refugees respectful and grateful. In June 2006 – one and a half years after the Boxing Day Tsunami – driving into the harbour area of Banda Aceh gave one the impression of driving into a fairground. A single gravel road snakes through kilometre after kilometre of buildings in all stages of completion. The carnival quality is due to the rainbow of colours that the buildings are painted and the variety of designs and placement. Some houses are low long bungalows, others are built in a vernacular manner. Some are elevated on stilts with staircases running up the side, and balconies wrapping themselves around the façade. Some have been built on hills of gravel, while others are nearly sitting in tide pools. And in which ever direction you look, you are met with competing logos, flags and billboards – most in English, all proudly taking responsibility for their section of the building patchwork. What is remarkable about the Achenese example, is perhaps less the amount of money allocated to housing – it is, after all, a vital component of a reconstruction effort where 500, 000 people were displaced – but rather the number of actors involved in, specifically, the reconstruction of housing and the high visibility of the reconstruction endeavour. According to the 2006 World Bank report – over 300 NGOs were involved in the reconstruction of houses – many with little or no prior experience in this sector. The scale, & high international profile of the disaster, and the commensurate high levels of money, meant that the numbers of independent, international NGOs was particularly high. Most concentrated in easily accessible areas – such as the capital, Banda Aceh – and, typical of post-crisis situations, many failed to go through the official coordination channels, meaning that their presence, and contributions, were initially unrecorded with either the government or the central coordinating body – the UN Office for the Coordination of Humanitarian Affairs, one of the few International Agencies who had kept international staff ‘in country’ after the collapse of the 2003 peace talks. But while the reconstruction effort attracted a large number of small, independent NGOs the majority of the housing reconstruction was undertaken by a few major players. These can be divided into three main categories. On the government side, the BRR is tasked with directing housing reconstruction. Overall, they are the largest reconstruction player with a portfolio “about twice as large portfolio as the next major player (Red Cross).” (Ivaschenko: 80). The Rehabilitation and Reconstruction Agency is the new government agency, created to oversee the reconstruction effort. Its head had a Ministerial rank, and the agency both builds houses and oversees the building by other agencies. On the side of the international community, the overall reconstruction effort was ostensibly coordinated by the UN – first by UN OCHA, and then by the Office of the Resident Coordinator (UN ORC). The UN, however concentrated strictly on coordinating, documenting and supporting the relief effort, leaving the physical reconstruction projects to be carried out either by the World Bank or by the large bilateral (national donors). A third category of reconstruction actors are the large, international non-government organizations (INGOs) such as the Oxfam, Christian Relief Services, Habitat for Humanity. The “massive global public fundraising that followed the tsunami” resulted in international NGOs having “unprecedented budgets. Some NGOs such as CARE, Save the Children, and various national Red Cross and Red Crescent societies each have over US$100 million to spend. This makes them larger than some donors or UN agencies” . (Burke & Afnan: 39). And, unlike UN Agencies, whose criticisms, though multiple, are usually indirect, International NGOs are answerable to private donations. The prominence of the disaster and its aftermath on Western news outlets, contributed to a record level of donations from individuals who had participated in the mass donation campaigns, and were eager to see the visible (and quick) impact of their aid dollars. And what is more accountable, countable, and visible than houses? Houses are easily identifiable symbols of reconstruction – emotionally satisfying to Western audiences. In the mind of Western audiences a Western house is a powerful, visual symbol of progress, and economic and social stability. For example, in the US, housing starts are an important indicator of economic growth (Hayden, 1986: 38) and private home ownership has at various times, been promoted as an explicit government policy to ensure social stability and encourage a more conservative political environment. They are particularly useful if the organization in question needs to spend large amounts of cash, quickly, as they involve large building contracts including materials. The construction of housing is also attractive become it is perceived by humanitarian organizations as relatively non-technical. It is also adaptable – allowing you to build as many units as you have money for. While high profile projects such as schools and hospitals are quickly ‘cherry picked’, the need for new houses is seemingly limitless and sells well to audiences (the donors) back home as an obvious human need. Much has been written on the slow pace of reconstruction. For our purposes, this means that by the time the international agencies and NGOs were ready to build, the need and demand was for semi-permanent or permanent housing rather than temporary. In addition to predictable construction bottlenecks (discussed below), the reliance of implementing agencies on national funding cycles and systems means that continued delays in the delivery of aid, makes temporary and even transitional shelter redundant for large proportions of the population: by the time the relief programmes are delivered, it is time to start building permanent shelter or temporary or transitional shelter becomes permanent through lags, and path dependence. It is also possible that there is a transfer of knowledge between international NGOs and aid agencies. People with similar functional knowledge, i.e. in post-disaster reconstruction, are moved from one zone to another bringing with them experience, knowledge, and contacts from previous disaster zones, meaning that this dominant mode of reconstruction remains largely unproblematized. In the case of international development, the inertia associated with any large organization, is amplified by a rapid staff turnover, limited funds for managerial development and often poor, or antiquated systems of record keeping. This means that experiences learned, and mistakes made are quickly lost (or covered up) and therefore, have a high likelihood of being repeated. 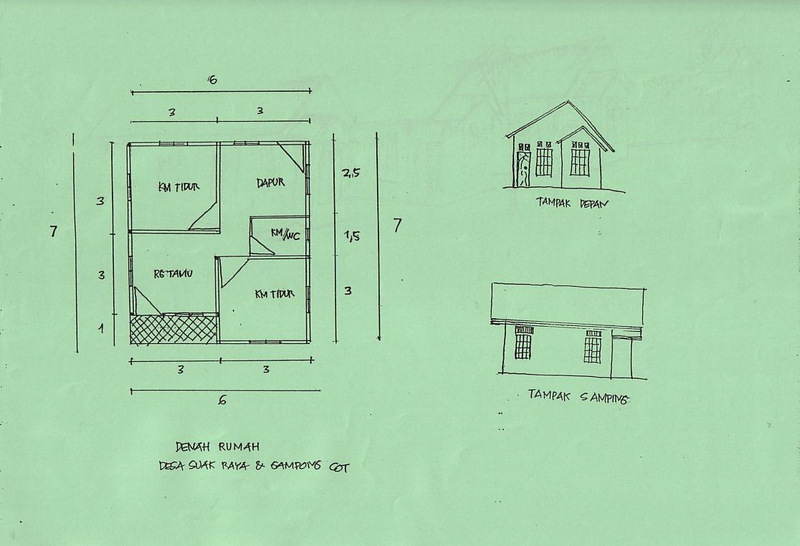 In Aceh, guidelines for reconstruction were set by the government – by the BRR. The BRR is the donor supported, government agency responsible for reconstruction. Initially created under another name, it was quickly re-established in its current guise after allegations of corruption and mismanagement. BRR developed guidelines for reconstruction based on previous building codes, but initial problems with the set up of the government agency meant that there were delays in actually issuing the guidelines. The rough ‘design guidelines’ were that the house should measure not less than 36 sq. m (not including bathrooms) and should be “constructed in accordance with applicable Indonesian building codes concerning building materials to be used and electrical and mechanical systems to be provided.” But these were not issued until approximately March 2005 and the final versions were not issued before June 2006. Further, the issue of translation added another level of interpretive difficulty, with many of the official documents being issued primarily in Indonesian. In the time spent waiting for these guidelines many agencies went ahead and started building houses. However, this was before the dynamics of a reconstruction effort of this scale were properly understood. As reconstruction began, the bottlenecks that would hamper reconstruction efforts for the next year and half, began to become apparent. Shortages of labour and building materials resulted in massive and rapid inflation far above any that had been factored into the cost projections for the houses, reducing the number of projected modules that the agencies could build and leading them to try and reduce unit cost, resulting in smaller, less fancy houses. Now instead of competing on design or grandiosity, the benchmarks for competition began on number of units, rapidity, quality of materials and location. Arguably, another type of competition – although one less easy to quantify – was ‘loyalty’ or allegiance from a specific community. The basic design was supposed to have in keeping with government guidelines – leaving little scope for major community input. It is hardly surprising, given this constraint, that the housing designs are all very similar. A survey by UN-Habitat of the housing designs by the various organizations operating in Aceh revealed an over-riding basic typology with certain key, recurrent variations. Although the BRR guidelines were not yet official, when the plans were designed, the guidelines, as expressed at various working groups and through consultation, was that the houses were to be 36 meters square, excluding terrace area. The majority of floorplans were roughly square, with a pitched (or double pitched roof). They all had two doors (a front and a back) and most had two bedrooms (kamar tidur), a living area (ruang tamu) and a kitchen (dapur). Where they varied was largely to do with the placement of the Toilet (W/C) and Bath/Sink (Kumar Mandi). 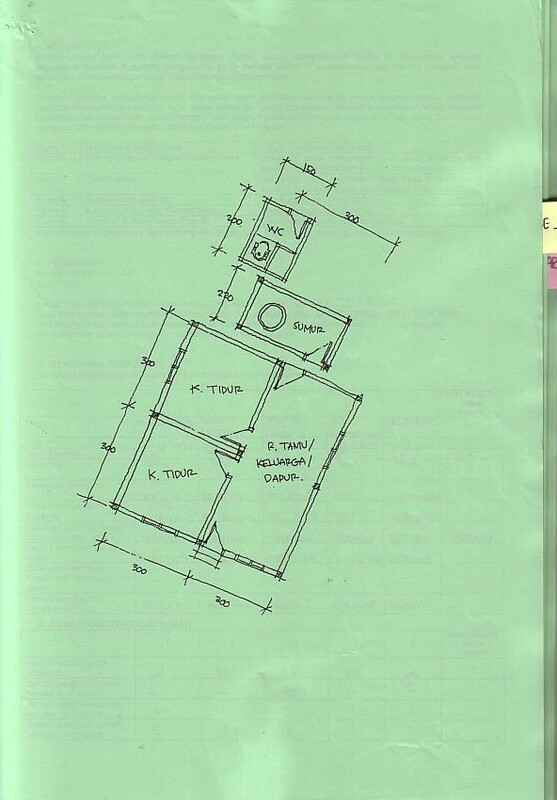 In some plans (such as the one’s by the NGO SOS Children’s Villages), the WC/KM was directly inside the house (Fig. 9) where in others, it was placed outside the back (Fig 10); built as a separate small building (Fig. 11); or simply non-existent. Informal interviews conducted in June 2006 with beneficiaries, contractors and workers for NGOs and multilateral organizations raised the location of the WC/KM as being a concern for some beneficiaries. Certain people said that having the mandi inside was in violation of Islamic laws, it may have been more in terms of local norms, as the houses planned by PKPU, a Jakarta based Islamic NGO, also included an interior WC/KM in their plans. There were also complaints that the houses did not provide for a sufficiently private area for female members of the household. 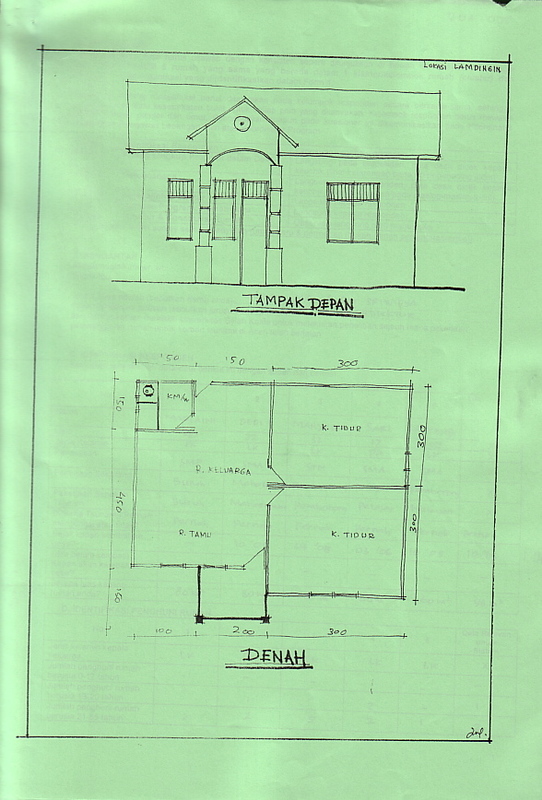 Such cultural preferences seemed to be only marginally reflected in the planning, although ornamentally it is possible to identify a vernacular touch in the choice of bright house colours (a typically Acehnese style) and occasionally, in the presence of an apparently ‘Islamic’ influenced pediment and entrance columns (see Fig. 12). And while there were a few plans put forward for multi family dwellings, the predominant approach remained that of the single family dwelling. Given the similarity across the donors, it is worth noting the degree to which some of the buildings, and settlements, appeared to convey the worldview of their donors. For example, the houses built by the US Agency for International Development (USAID) houses were identifiable by their standardization. USAID houses were uniform, square, and tended to be on the small side. They were constructed of and were built in long, perfectly straight lines. 18 months after the disaster the houses observed in Banda Aceh, were not yet completed, and none were occupied, but the lines and grids of houses were immediately identifiable as a USAID product. At that stage there was no ornamentation, and the houses, looked as though no one had worked upon them for some time: the grass was growing long through the foundations, and frames, and there was no construction going on. Still, proudly displayed – clear and well maintained – were banners with the USAID logo. This was contrasted with the much lauded houses contributed by Turkish Relief. Their houses were built on significantly larger plots of land, and the houses themselves, although only slightly larger, had some structural variation in shape: they had a small porch and a triangle over the front door, complete with an Islamic Crescent. Pink in colour, they had a front window approximately 1 m sq, into the front, multipurpose, living room with glass. The Turkish houses were much remarked upon as being particularly well made. The BRR also built some of their own houses. Informal site interviews highlighted problems of poor and slow construction. In the case of Aceh, there is also the need to mention one type of “temporary shelter”: the ‘barracks’ which are long, thin buildings, normally used to house soldiers, with a long thin balcony running along the front. Immediately after the disaster the Indonesian army built these to house large numbers of displaced persons quickly. And while, initially there was fear that this was to be used as a population control strategy by the military, this fear remained unrealized. When it became clear, that there was no ulterior motive to the building of barracks, other donors – including GTZ – replicated this form of temporary housing. These barracks were still being used 1.5 years after the tsunami – housing large numbers of families who are increasingly treating them as permanent, rather than temporary houses including decorating them with plants, and other ornamentation. From a public health perspective, this raises concerns over the lack of sanitary facilities such as running water, and toilets. Water is supplied to the barracks from tanks, and many families live side by side, with little or no privacy. The locations of these barracks may also have an impact on the social structures of Banda Aceh, as they were built in what was, immediately post tsunami, considered to be ‘temporary’ locations. One group of barracks is concentrated directly beside the wind ravaged, and yet unreconstructed, stadium. If this grouping of ‘temporary’ barracks persists, how will this play out in terms of developing a (new) community? The idea that temporary shelter can (and should) be convertible into permanent housing is the physical manifestation of the idea that the humanitarian response should meld seamlessly into long term development planning (the ‘relief to development’ continuum) In Aceh, the International Committee for the Red Cross experimented with a type of ‘transitional’ shelter which was supposed to be easy to put up and could be used also as semi-permanent housing. But the uptake of these structures was not great – many remained unlived in, 1.5 years after the disaster – deemed unacceptable by the local populations. The idea behind the development of the cottage was in response to a similar type of reluctance by the end user to a transitional solution. Various reports claimed that the FEMA trailers were not aesthetically desirable, not sufficiently comfortable and even that they led to an increase in crime in the neighborhoods in which they were located (Fornoff, 2005). Reluctance of permanent residents to have them located in their neighborhoods can make post-disaster planning difficult. The history of international development, of which humanitarian response is a part, is a history of (often failed) social experiments; the idea of the hinterland, the margin, the reconstruction site as a unique space where innovative and unexpected events may occur is a well developed theme. In these spaces, the lack of oversight, accountability, or continuity makes them particularly open to the implementation of progressive or avant-guard practice; to the implementation of designs and forms of the built environment which will better the human condition. Similarly, within the Western architectural imaginary, the ‘reconstruction site’ has always occupied a prominent place. By virtue of their seeming blank slate quality, their lack of restrictions, the phoenix-like potential – they are perceived as sites of enormous potential for those architects wishing to push the boundaries of architectural practice (viz. Diller & Scofidio). Over the years, a wide range of super-star architects have put forward their proposals for post-disaster housing. For example, Corbusier’s iconic Maison Dom-ino (1914-15) was originally intended as a “solution for the rapid reconstruction of regions such as Flanders, which had been heavily damaged during WW1.” (Stohr: 36) Between 1939 and 1945, Finnish architect, Alvar Aalto designed a movable temporary emergency shelter, designed to house war refugees that ‘could be trucked to the site and house four families with a shared central heating unit’. (Stohr: 37) “Prouvé also developed a number of prefabricated shelters, including a metal-frame tent, demountable barracks and schools for war refugees that he called ecoles volantes.” (Stohr: 39) And while, not strictly speaking for post-disaster response, during the 1940s, Buckminster Fuller designed the Dymaxion Deployment Unit – a form of ‘emergency accommodation for troops in various locations during WW2.” (Stohr: 38) More recently, Studio Libeskind has been involved in the design of a Master Plan for Unawatuna – a beach side community in Sri Lanka, devastated by the Tsunami. However, in the approaches that we have considered, ideas of comfort and home have been bound up in ideas of nostalgia, the ‘traditional’ or ‘the vernacular’, but as we have seen from the built form of the Katrina Cottage, and from the process of reconstructing post-Tsunami Banda Aceh, these ideas are themselves have been informed by the history of intervention and reconstruction. Indeed they embody and reproduce, as part of the humanitarian imaginary, the nostalgia/utopia of humanitarian intervention and salvation first, in the belief that it is possible to control first place, and ultimately time. The marketing of place – of utopic space – is a key part of reconstruction. For example, if we consider New Urbanism – the urban design movement which the designers of the Katrina Cottage espouse: it originated in the US, in the1980s in response to the problems identified with suburban sprawl. New Urbanism is best known for its ‘model towns’ – planned neighbourhoods based on strict urban planning principles such as densely backed, walkable neighborhoods with mixed use and mixed age buildings. New Urbanism promotes the notion of ‘natural variety’ and that architectural and planning decisions should follow a transect approach to planning, respecting the essential truth that different areas have different qualities – different flora, fauna, and social norms. They identify 6 different ‘context zones’ ranging from the rural to the urban. According to the website of the New Urban Guild, “the list of things that change along the transect is far too long to fully include here [in the principles for transect planning].” Readers are advised to “[j]ust look around you; you’ll see it in all the great old places.” What we will see are the essential qualities of a place that should be respected during the design, planning and development process. Two of the best known New Urbanist developments are the towns of Seaside, California, and Celebration, Florida. Both Seaside – used as the backdrop for the 1998 movie, The Truman Show, and Celebration – commissioned by the Walt Disney Corporation – perpetuate through their urban layout and architectural choices, a neo-traditional aesthetic of small town America, where, “women call in their kids to do homework and old men sit outside the general store.” New Urbanists have been accused of perpetuating an imaginary idea of the US and their critics have seized upon what they perceive to be an exploitation, of “a yearning for an imaginary small-town America” and the explicit call for a return to so called traditional social relations through urban and architectural design is evidenced by the above quote. Consider the tension identified by Hayden with regards to form versus programme – can changes to the programme be made through the base. If suburban sprawl is the result of underlying, structural dynamics, can local, largely aesthetic decisions reverse these trends? Is it possible to imagine reversing capitalist trends through local planning decisions, when the social and economic relations that underpin ownership, employment, family relations, and ultimately place, are driven. Surely, they can only be temporary enclaves in the sea of progress, Looking at the dubious legacy of Celebration, Florida, where – according to Hayden, it seems likely that the original community (Phase I) provided the marketing hook for future, replica villages, suddenly New Urbanism rather than reversing sprawl, is merely replacing the grid like suburbia of the 1940s and 50s America with the 21st century version of the picturesque enclave. (Hayden, 2003). And indeed, the enclave model is one that is aspired to – evoked not only through the design and aesthetic, but also by the romantic, pastoral rhetoric of the movements’ propaganda. The marketing material for the Katrina Cottage is rife with a similar nostalgic, aspiration – promising not only a chance to rebuild and recovery, but to regain a sense of place and belonging that was arguably lost long before Katrina ever hit. In disaster literature, and practice there is a recognition of the complexity involved in defining a disaster as a discrete event. Still, the formal engagement with the situation, defines a ‘starting point’ at which the disaster is brought into public awareness and creates a before and an after. This distinction allows for a romanticization of the pre-disaster situation. As discussed above, this may be done through the largely arbitrary use of such terms of ‘traditional’, ‘vernacular’ and ‘authentic’. These terms often serve as a modifier for existing, pre-formulated design solutions. For example, in the case of the designs put forward after the Tsunami, a housing design would become ‘vernacular’ by the addition of a specific ornament, or a coat of paint in a ‘traditional’ colour, whereas post-Katrina, ‘Traditional Mississippi style’ seems oddly synonymous with ‘has a front porch.’ The romanticization of a pre-disaster state, through a focus on design solutions obscures pre-disaster dynamics – which as we saw so starkly in the case of Katrina – inform the severity and demographic impact of the disaster. Consider the advertised virtue of the Katrina Cottage as its ability to ‘take a swim.” “Even if it’s completely submerged in a flood, you simply remove any furnishings that have absorbed water, hose down the interior, and replace the electrical switches.” This neglects the larger issues of why it is necessary for certain people to rebuild in locations where their houses must be submergible. Because of the power dynamics identified above – skewed in favour of external actors – it is possible that the reconstruction project, may be biased toward a spatial approach, at the expense of a more nuanced one that also incorporates a temporal element. From a development perspective, this can be seen in the lack of continuation, oversight, evaluation or follow up. All the focus is on the built product, the physical outcome. It is also seen in the broader dynamic of international reconstruction work which sees each reconstruction site as an event, one in a series of reconstructions – creating a network or horizon – between reconstruction sites, rather than seeing the disaster as part of the continuum of the place in which it occurred. The problematique of attributing spatial or geographic attachment of a certain group of people to a specific place is notoriously difficult. All people are a unique amalgam of places, traces and experiences derived from a range of geographies and locales. However, in the context of a reconstruction site, it is possible to differentiate between ‘local’ and ‘external’ actors. External actors can be defined as those organizations that are brought to a reconstruction site through the political economy of humanitarian assistance: they would not be in the reconstruction site, had it not been for the event of the disaster. In the context of a disaster, this binary could also be described as the relationship between donor and recipient; saviour/victim; capable/incapacitated and so on. These categories are reified within the institutional structure of disaster response where they are given geographic attribution: North-South, or the ‘West and the Rest’. Many authors distinguish between international (external) and local actors with respect to their physical and economic relationship to the reconstruction process. The claim is often made that those actors who do not have demonstrable ties to the damaged area should not have a voice in the reconstruction, or their voice should be weighted to reflect their origin and physical relationship to the site. In some ways this makes perfect sense – those people who are the ‘beneficiaries’ of the reconstruction should have more of a say in the design of the response. In others, it is a conservative approach which assumes that place may be geographically discrete, and that identification with place implies primary rights to that locale. It neglects the interdependencies of that place or the layers of ownership. However, post-colonial scholars have critique such a binary narrative for its failure “to acknowledge the ways modernity is constantly in negotiation and constructed not only vis-à-vis the West but within non-Western places.” (Besio, 2007: 72) Through her work on tourism in Northern Pakistan, Besio (2007) problematizes the attribution of geographic origin to particular modes of thought. While a superficial reading of the interactions of western travelers to northern Pakistan would seem to suggest a modern/non-modern split between travelers and local resident, she suggests drawing on the work of Timothy Mitchell and Chakrabarty (2000) that the categories are much more nuanced. In the same way, it is important to recognize the iterations of identity construction that are going on in the process of reconstruction. 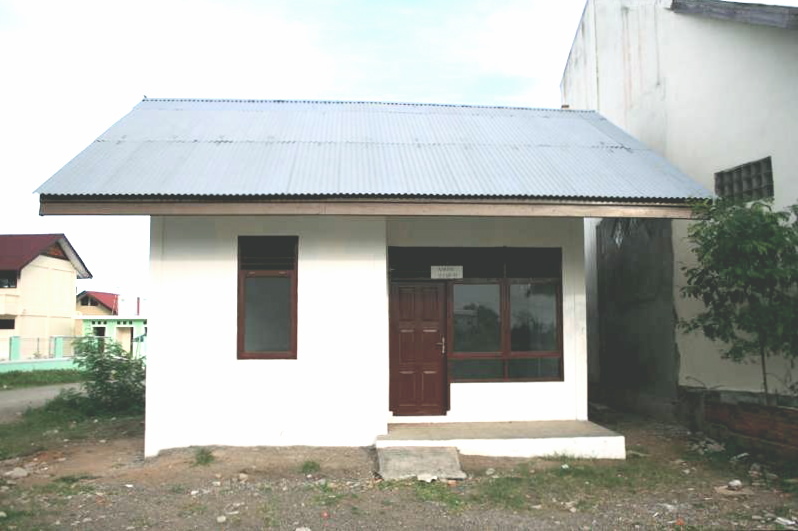 For example, in Banda Aceh, designated recipients of new houses were reluctant to accept homes made of more resilient and less dangerous materials such as cinder block, insisting instead on brick houses – an option which is much more likely to cause bodily harm, in the case of an earthquake – based on its status value. In practice though, in a post-disaster context, the money or expertise of the external actors – their power – allows them a voice in a discussion that they would not normally have a right to participate in: how to reconstruct the built environment of a society. Inevitably, those actors who are not normally physically located in the area, the normative framework from which they are operating is (at least partially) representative of/constructed by the societies, and communities where they are regularly located; as well as by their own needs and incentives and their perceptions of the needs and incentives of the recipients. This tension is manifest in international development thinking, where, according to Pupavac (1995), “international development now offers so little materially to populations globally, its continuing existence may perhaps better be understood as addressing the therapeutic needs of the international community to feel a sense of moral purpose.” Combined with the tendency for external actors to experiment with utopian futures, or recreate nostalgic pasts, reconstruction sites provide a key geographic locale for the othering of a Western, humanitarian identity. The portrayal of reconstruction sites and their occupants as chaotic, incompetent, disabled, disorganized, corrupt, needy simultaneously sustains the superiority of those external actors who are assisting, and justifies introduction and use of various techniques of governmentality: monitoring, oversight, reporting, management structures. Shock and outrage have been the reaction when the same problems have occurred in the reconstruction process in New Orleans, as have been seen elsewhere – incompetent, slow, or corrupt contractors; disputes over land ownership and tenure, the janus faced nature of the ‘victims’ who may try to play the system for their benefit. Such behaviour and attitudes have been understood to be those of poor, disaster victims in places far away, not contained within the geographic confines of the West. The built form of the house is thus important both through its positive contribution to the creation and reinforcement of a Western humanitarian identity by offering ‘concrete’ examples of social ideals, AND through the neo-Orientalist role which physically locates the needs, inadequacies, ineptitude and simplicity of the victims of the disaster in a specific, external geographic local – the reconstruction site. It is in these sites, that the West looks to both reassure and define itself. Adiwibowo, Andrio. “One Year Later, Still Stuck in the Mud.” Jakarta Post, June 1 2007. Bakker, Karen “Katrina: The Public Transcript of ‘Disaster’.” Environment and Planning D: Society and Space 23 (2005): 795-809. Bauman, Zygmunt. Community : Seeking Safety in an Insecure World: Polity, 2000. Beck, Ulrich, and Mark Ritter. Risk Society : Towards a New Modernity: Sage Pubns., 1992. Burke, Adam and Afnan. “Aceh: Reconstruction in a Conflict Environment: Views from Civil Society, Donors and N.G.O.S.” In Indonesian Social Development Paper DFID, 2005. Campbell, David. “Geopolitics and Visuality: Sighting the Darfur Conflict ” Political Geography 26 (2007): 357-82. Certeau, Michel de. The Practice of Everyday Life. Translated by Steven Rendell. Berkeley: University of California Press, 1988. Chesterman, Simon. You, the People : The United Nations, Transitional Administration, and State-Building. Oxford: Oxford University Press, 2004. Cornelis, Tom, Antonella Vitale. Transitional Settlement: Displaced Populations Oxford: Oxfam and Univeristy of Cambridge shelterproject 2005. Corsellis, Tom, Antonella Vitale, Yasemin Aysan, Ian Davis. “Exploring Key Changes and Developments in Post-Disaster Settlement, Shelter and Housing, 1982-2006: Scoping Study to Inform Revision of ‘Shelter after Disaster: Guidelines for Assistance’.” United Nations/OCHA, 2006. Cuny, Frederick C., and Susan Abrams. Disasters and Development. New York: Oxford University Press, 1983. Cutter, Susan. 2006. The Geography of Social Vulnerability: Race, Class and Catastrophe. In, Social Science Research Council http://understandingkatrina.ssrc.org/Cutter/. (accessed May 31, 2007). Eliade, Mircea. The Myth of the Eternal Return : Or, Cosmos and History, Bollingen Series 46. [Henley-on-Thames]: Routledge & Kegan Paul, 1982. Ferguson, James. Global Shadows : Africa in the Neoliberal World Order. Durham, N.C. ; London: Duke University Press ;, 2006. Graham, Stephen. 2006. Cities under Siege: Katrina and the Politics of Metropolitan America In, Social Science Research Council http://understandingkatrina.ssrc.org/Graham/. (accessed May 31, 2007). Hales, Linda. Oct. 15, 2005. In Mississippi, the Reshape of Things to Come In, washingtonpost.com, Washington Post. (accessed April 5, 2007). Hayden, Dolores. Building Suburbia : Green Fields and Urban Growth, 1820-2000. New York: Pantheon Books, 2003. ———. Redesigning the American Dream : The Future of Housing, Work, and Family Life. New York: W.W. Norton, 1984. Hetherington, Kevin. The Badlands of Modernity : Heterotopia and Social Ordering. London ; New York: Routledge, 1997. Ivascheno, Oleksiy, Ahya Ihsan and Enrique Blanco Armas. “Aceh Public Expenditure Analysis: Spending for Reconstruction and Poverty Reduction “, 132: The World Bank Group 2006. Kent, Randolph C. Anatomy of Disaster Relief : The International Network in Action: Pinter, 1987. Kraftl, Peter “Utopia, Performativity, and the Unhomely.” Environment and Planning D: Society and Space 25 (2007): 120-43. Lane, Barbara Miller. Housing and Dwelling : Perspectives on Modern Domestic Architecture. London: Routledge, 2007. ———. Housing and Dwelling : Perspectives on Modern Domestic Architecture. London: Routledge, 2005. Marcus, Clare Cooper. House as a Mirror of Self : Exploring the Deeper Meaning of Home. Berkeley, Calif.: Conari Press, 1995. Massey, Doreen. For Space. London: Sage, 2006. Mitchell, Timothy. Questions of Modernity, Contradictions of Modernity ; V. 11. Minneapolis ; London: University of Minnesota Press, 2000. Oxfam. “A Place to Stay, a Place to Live: Oxfam Briefing Note.” 14: Oxfam, 2005. Perry, Rex “Katrina Cottages.” Review of Reviewed Item. Cottage Living, no. (2006), www.cottageliving.com/cottage. Rybczynski, Witold. Home : A Short History of an Idea. London: Heinemann, 1988. ———. 2006. The Katrina Cottage: Cute Beats Cutting-Edge When It Comes to Temporary Shelters. In, Slate. (accessed July 31, 2007). ———. 2005. There’s No Place Like Home: The Historical Problems with Emergency Housing. In, Slate. (accessed July 31, 2007. Scott, James C. Seeing Like a State : How Certain Schemes to Improve the Human Condition Have Failed, The Yale Isps Series. New Haven ; London: Yale University Press, 1998. ShelterCentre. “Shelter after Disaster 06b.” Paper presented at the Shelter Meeting 06b, 16 November 2006. Smith, Neil 2006. There’s No Such Thing as a Natural Disaster. In, Social Science Research Council http://understandingkatrina.ssrc.org/Smith/. (accessed May 31, 2007). Snyder, Mike. “Mississippi Communities Hope to Avoid Sprawl in Rebuild.” HoustonChronical.com, June 3, 2007 2007. Stohr, Kate ed. Design Like You Give a Damn: Architectural Responses to Humanitarian Crisis Edited by Architecture for Humanity. London: Thames & Hudson Not Specified. UN–HABITAT. “Building Houses, Rebuilding Communities: Un-Habitat Post-Tsunami Reconstruction Effort in Indonesia.” edited by UN–HABITAT Regional Office for Asia & the Pacific, 3: UN-Habitat, 2005. UN–HABITAT/OHCHR. “Housing Rights Legislation – Review of International and National Legal Instruments.” Nairobi: United Nations Housing Rights Programme, 2002. UNDRO. “Shelter after Disaster: Guidelines for Assistance.” New York United Nations 1982. Vidler, Anthony. The Architectural Uncanny : Essays in the Modern Unhomely. Cambridge, Mass. ; London: MIT Press, 1992. Wilson, David ed. The Sphere Project: Humanitarian Charter and Minimum Standards in Disaster Response The Sphere Project 2004. Depending on the climate, a human being is physically unable to survive for long without the protection from the elements afforded by a shelter. In addition to meeting the immediate needs of its users against the elements, shelter also provides protection by providing a barrier to its inhabitants from wild animals, or aggressive humans. Depending on the quality of its construction, it also secures its inhabitants against pests and vermin, and allows for a higher degree of hygiene and sanitation for its inhabitants by separating different human functions from one another. David Wilson, ed., The Sphere Project: Humanitarian Charter and Minimum Standards in Disaster Response (The Sphere Project 2004). UN–HABITAT/OHCHR, “Housing Rights Legislation – Review of International and National Legal Instruments,” (Nairobi: United Nations Housing Rights Programme, 2002). As quoted in Tom Cornelis, Antonella Vitale, Transitional Settlement: Displaced Populations (Oxford: Oxfam and Univeristy of Cambridge shelterproject 2005). Beyond emergency shelter guidelines, UNDRO, “Shelter after Disaster: Guidelines for Assistance,” (New York United Nations 1982).no official international standards exist for the reconstruction of permanent houses after a disaster. These guidelines are currently under review. See ShelterCentre, “Shelter after Disaster 06b” (paper presented at the Shelter Meeting 06b, 16 November 2006). In a relief situation, the distinction between temporary, transitional (semi-permanent) and permanent housing refers to the length of time that the building is intended to be used for, and therefore, is also indicative of the types of building material used, as well as potentially, site location. Typically, temporary housing refers to tents (or some variant) while permanent refers to buildings made out of brick or concrete. Transitional is more ambiguous and all three categories are ultimately dependent upon the geographic situation. For more on distinction between relief and development see Simon Chesterman, You, the People : The United Nations, Transitional Administration, and State-Building (Oxford: Oxford University Press, 2004). See Witold Rybczynski, The Katrina Cottage: Cute Beats Cutting-Edge When It Comes to Temporary Shelters (Slate, March 31 2006 [cited July 31 2007]). Both agencies used different modalities, however. 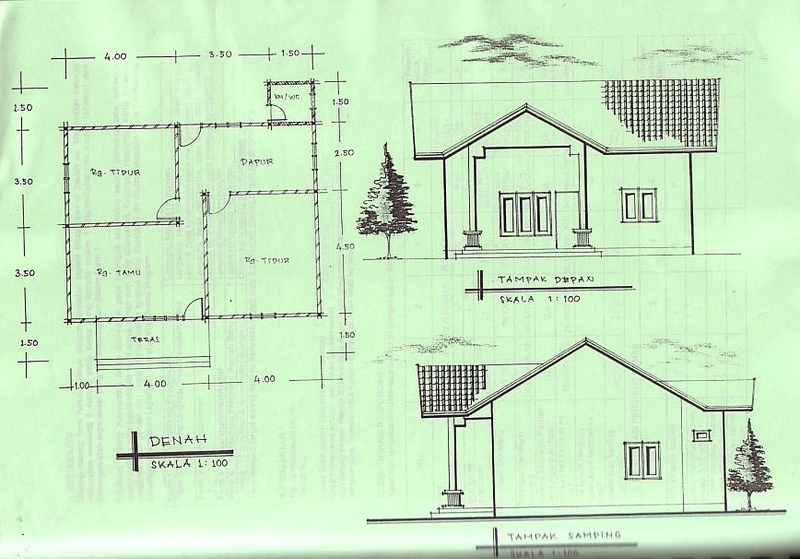 The IFRC primarily outsourced their housing contracts to other NGOs and developments agencies, whereas the CRS used Acehnese engineers, architects and builders to build the houses. For an excellent overview of various architectural models for emergency shelter see Kate Stohr, ed., Design Like You Give a Damn: Architectural Responses to Humanitarian Crisis (London: Thames & Hudson Not Specified). In 1943, 44 states signed a convention to create the UN Relief and Rehabilitation Agency which was replaced only a few years later (1946 – 1947) by four separate functionalist agencies – The UN International Children’s Emergency Fund (UNICEF, created1946), The International Refugee Organization (IRO, 1948), The Food and Agriculture Organization (FAO, 1945), and the World Health Organization (WHO, 1946). Out of these, only the WHO had a ‘clear cut reference to the principle of universal emergency assistance. Stephens, as quoted Randolph C. Kent, Anatomy of Disaster Relief : The International Network in Action (Pinter, 1987).38. See Chapter 2 , Ibid. for an overview of the development of international response from WW2 to the late 1980s. Frederick C. Cuny and Susan Abrams, Disasters and Development (New York: Oxford University Press, 1983). C.f. Tom Corsellis, Antonella Vitale, Yasemin Aysan, Ian Davis, “Exploring Key Changes and Developments in Post-Disaster Settlement, Shelter and Housing, 1982-2006: Scoping Study to Inform Revision of ‘Shelter after Disaster: Guidelines for Assistance’,” (United Nations/OCHA, 2006), ShelterCentre, “Shelter after Disaster 06b”. See James C. Scott, Seeing Like a State : How Certain Schemes to Improve the Human Condition Have Failed, The Yale Isps Series (New Haven ; London: Yale University Press, 1998). and work by James Ferguson, Global Shadows : Africa in the Neoliberal World Order (Durham, N.C. ; London: Duke University Press ;, 2006). for examples of large scale development schemes gone awry. This is contrasted with two other dominant programmes: “the industrial strategy produced the program for high-rise mass housing treated aesthetically as an efficient machine for collective consumption; and the neighborhood strategy produced the program for low-rise, multi-family housing treated aesthetically as a village with shared commons, courtyards, arcades, and kitchens.” Dolores Hayden, Redesigning the American Dream : The Future of Housing, Work, and Family Life (New York: W.W. Norton, 1984). Clare Cooper Marcus, House as a Mirror of Self : Exploring the Deeper Meaning of Home (Berkeley, Calif.: Conari Press, 1995). See also Anthony Vidler, The Architectural Uncanny : Essays in the Modern Unhomely (Cambridge, Mass. ; London: MIT Press, 1992). cf. Mircea Eliade, The Myth of the Eternal Return : Or, Cosmos and History, Bollingen Series 46 ([Henley-on-Thames]: Routledge & Kegan Paul, 1982). and Martin Heidegger’s seminal essay “Being, dwelling, thinking” reproduced in Barbara Miller Lane, Housing and Dwelling : Perspectives on Modern Domestic Architecture (London: Routledge, 2005). Recent artwork by Geraldine Pilgrim, challenges the binary categories of female/male; inside/outside by bringing elements of the outside ‘in’ (a young girls bedroom has trees growing in it) and a sitting room is overwhelmed by snowdrifts of teacups – disrupting the domestic calm of the interior through the introduction of the outside. See also work by Suzanne M. Spencer -Wood in Barbara Miller Lane, Housing and Dwelling : Perspectives on Modern Domestic Architecture (London: Routledge, 2007). Hayden considers the promotion of the detached house as the overt decision of American capitalist interests to move women away from their war time roles as factory workers, and back into the domestic sphere – removing any their emergent power as wage earners while encouraging their increased consumption. “Developers argued that a particular kind of house would help the veteran change from an aggressive air ace to a commuting salesman who loved to mow the lawn. He would also assist his wife to forget her skills as Rosie the Riveter and begin to enjoy furnishing her dream house in suburbia.” Hayden, Redesigning the American Dream : The Future of Housing, Work, and Family Life. 42. The value attributed to domesticity can also be seen in, England, in the 1800s. Throughout the 1800s there was an increased emphasis amongst the British upper classes, on the house as a center for both leisure and for private contemplation. The material expression of these social trends was the rise of the picturesque with its emphasis on rural retreats and organic, romantic form; as well as the return to neo-classical forms of construction, favoured by the 16th c. Venetian architect Palladio and his latter day enthusiast, Inigo Jones. These trends coincided with an increased emphasis on the value of privacy – on the importance of private space. “The desire for a room of one’s own was not simply a matter of personal privacy. It demonstrated the growing awareness of individuality – of a growing personal inner life – and the need to express this individuality in physical ways.” Witold Rybczynski, Home : A Short History of an Idea (London: Heinemann, 1988). 111. I explore this theme of the reconstruction site as borderland, in my other work. Further research is required on the genealogy of the 1906 SF Earthquake Cottages. See http://www.outsidelands.org/shacks.php [last accessed August 1, 2007] for more information. There are a host of problematic assumptions contained within these definitions including the pre-existing equality of a society’s citizens to travel to, experience, ‘most loved places’ and therefore to equally define its living traditions. Hayden, Redesigning the American Dream : The Future of Housing, Work, and Family Life. :99-100. Hayden, Redesigning the American Dream : The Future of Housing, Work, and Family Life.18. This would be very interesting, and worthy of further investigation. This was even more the case in Sri Lanka, where the easy accessibility of affected areas and the familiarity of the Island as a popular holiday destination meant that many more Westerners actually came to help with the reconstruction. after the collapse of the 2003 peace talks, most international agencies and NGOs left Aceh, “as the government made it increasingly difficult for them to operate.” Adam and Afnan Burke, “Aceh: Reconstruction in a Conflict Environment: Views from Civil Society, Donors and N.G.O.S,” in Indonesian Social Development Paper (DFID, 2005). : 3. It has also served a key role in the peace process by providing jobs to high ranking GAM officials. For work on media representations of disaster see David Campbell 2004 and Moeller 1999. Taken from Attachment B, Regulation of Executing Agency Rehabilitation and Reconstruction Agency and the Lives of the People of Nanggroe Aceh Darussalam Province and Nias Island, North Sumatra Province [sic] On Policies and Administration of Housing and Settlement Assistance for Victims in the Post-Disaster Area (2006) DRAFT. “Since the tsunami, prices in Aceh have increased more sharply than the national average. The most dramatic increase is in Banda Aceh where year-on-year inflation in June 2006 was almost 30 percent, down from 41 percent in December 2005. The increase in prices has been mostly driven by increases in transport costs that in turn have been the major determinant in the increase in the cost of construction materials (year-on-year inflation of brick, wood, and sand was 83 percent, 124 percent, and 164 percent respectively by December 2005). Labor costs also increased significantly in 2005; up 40 to 50 percent across all categories of construction workers. On a less pessimistic note, since January 2006 prices for both material inputs and labor have remained relatively stable at the high 2005 levels but they have not increased significantly since then. The impact of inflation is readily shown by the fact that BRR has increased the average unit cost of new houses from its original estimate of Rp. 28.5 million to Rp. 53 million- an increase of some 85 percent.” Oleksiy Ivascheno, Ahya Ihsan and Enrique Blanco Armas, “Aceh Public Expenditure Analysis: Spending for Reconstruction and Poverty Reduction ” (The World Bank Group 2006).111. SOS Children’s Villages are an example of an NGO whose mandate does not normally include the reconstruction of houses for families. The Islamic Code of Qadaahul Haajah has strict prescriptions regarding personal hygiene including that one should be out of sight of people when going to the toilet. It should be noted, that the responses given, may have been to some degree slanted to what the interviewee thought that I wanted to hear, since, I, the interviewer, was white, and by appearances from ‘an NGO’. Cf. Scott, Seeing Like a State : How Certain Schemes to Improve the Human Condition Have Failed. or works by James Ferguson. Cf. Kevin Hetherington, The Badlands of Modernity : Heterotopia and Social Ordering (London ; New York: Routledge, 1997). A fascination can be identified, in architectural desig with the temporary structure, the emergency shelter. This can be seen in the popularity of Shuguru Ban’s designs and the attention given to the design proposals for post-Katrina reconstruction at the 2006 Venice Bienalle. For example, see the work of Japanese architect, Shiguro Ban. Witold Rybczynski, There’s No Place Like Home: The Historical Problems with Emergency Housing (Slate, 2005 [cited July 31, 2007). Associated movements include the Smart Growth Movement, the Congress for New Urbanism, The Guild Foundation. Linda Hales, In Mississippi, the Reshape of Things to Come (washingtonpost.com) (Washington Post, Oct. 15, 2005 [cited April 5 2007]). Stephen Graham, Cities under Siege: Katrina and the Politics of Metropolitan America (Social Science Research Council 2006 [cited May 31 2007]); available from http://understandingkatrina.ssrc.org/Graham/. identifies a possible ‘anti-urbanism’ in the reconstruction of New Orleans. Rex Perry, “Katrina Cottages,” review of Reviewed Item, Cottage Living, no. (2006), http://www.cottageliving.com/cottage. In other descriptions, it has been referred to as ‘The Cottage that can go for a swim.” – from the April 2006 issue of New Urban News (www.newurbannews.com) (last accessed on April 5th, 2007). The issue of mobility is an interesting one in two respects: first, in the role that it plays in transitional and temporary housing and the However, With the rise of mass produced housing, the interpretation of ‘one’s own’ began to emphasize the need for aesthetic detailing, which emphasized the ‘sacred hut’ quality as well as en element of grounding. The distain with which mobile homes and caravans are regarded within popular culture, may be partly attributable to their cultural associations with certain class behaviours, but it may also be due to the antipathy with which nomadic or transient behaviour is regarded. An article in the Jakarta Post, describes the policy [he does not specify whose, although the implication is that of the Indonesian government] of “visiting, donating and forgetting that has been applied to victims of the Aceh tsunami and the Yogayakarta earthquake.” Andrio Adiwibowo, “One Year Later, Still Stuck in the Mud,” Jakarta Post, June 1 2007. C.f. Chesterman, You, the People : The United Nations, Transitional Administration, and State-Building. Granted, that no matter how small the locale, multiple identities, values, and visions would enter into considerations of the reconstruction. Even if the individuals and organizations were geographically located in the reconstruction site, the complexity of their identifies, histories and external geographic allegiances would mean that the reconstruction would, inevitably, incorporate elements of external (to the reconstruction zone) considerations, values, and expectations (viz. Michel de Certeau, The Practice of Everyday Life, trans. Steven Rendell (Berkeley: University of California Press, 1988). For example, the occurrence of a level 4 or 5 hurricane in New Orleans was regarded as an inevitability by its residents. See Karen Bakker, “Katrina: The Public Transcript of ‘Disaster’,” Environment and Planning D: Society and Space 23 (2005). Dan Baum’s regular column in the New Yorker has been excellent at revealing these tensions. Arguably, this incomprehension, was responsible for the visual distancing (othering) – in the footage of the immediate post-disaster situation the faces chosen to be broadcast, were of poor, black, New Orleans residents. And they were geographically contained within a specific, seemingly separate geographic locale – the superdome. That the superdome was not physically cut off from the rest of the city – connected, as it were by a bridge – was arguably not communicated through the media coverage. Likewise, the resonance with the ‘thunderdome’ and the chaotic, apocalyptic imagery from Mad Max was hard to miss.